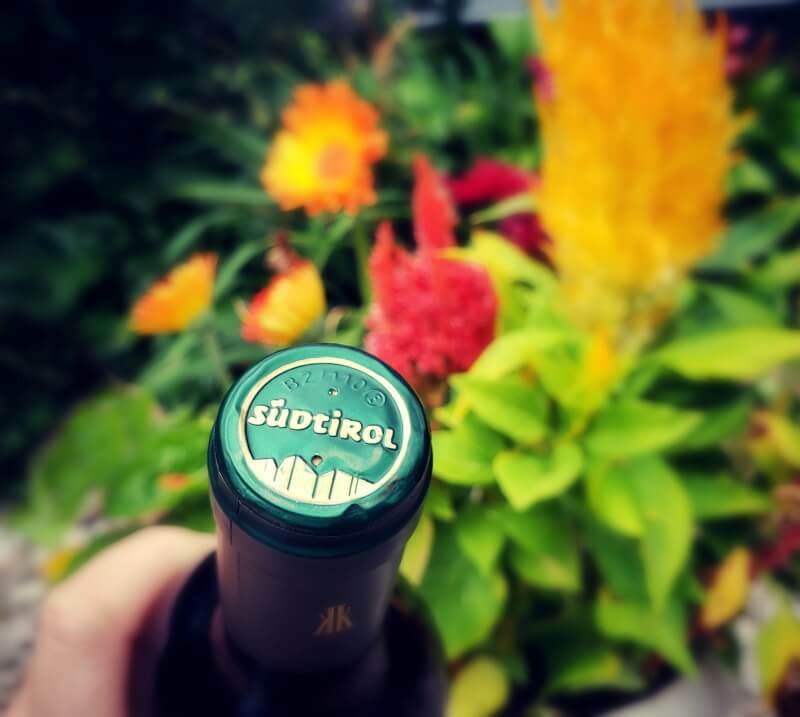 South Tyrol’s wine’s are amazing and driving through the vineyards can be an amazing experience! 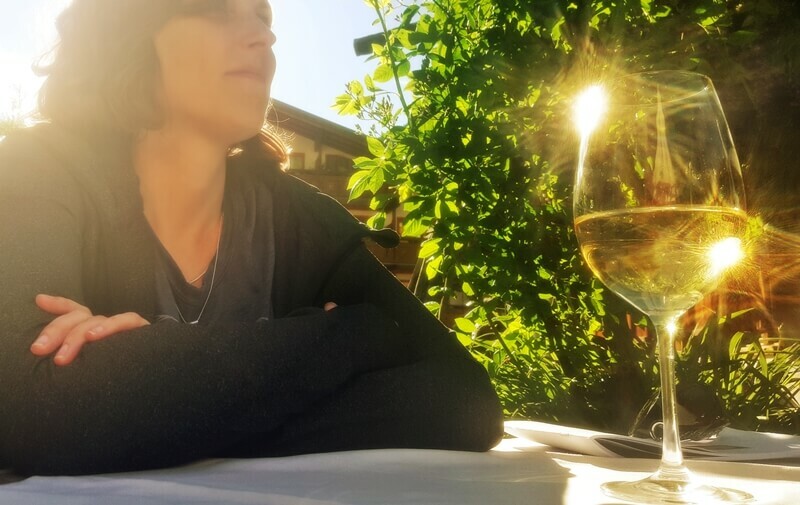 I agree with you – even for me, a summer is incomplete without going for some wine tasting. Wine paired with delicious food is the perfect summer experience in my opinion. Oh I wish I lived somewhere that such experiences were more accessible to me! I live in a desert! I’ve never heard of this wine region before but it looks like a wonderful place to spend a weekend and just relax and sip wine. I’ve only been to the one in Napa Valley and really enjoyed our time there. Thanks for sharing! Thanks for the comment Janna. 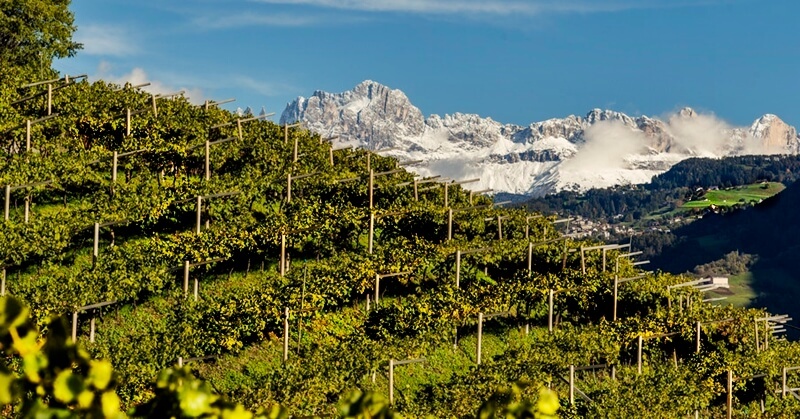 Glad we could introduce you to the wines of Alto Adige / South Tyrol! I love me a good Gewürztraminer so this region sounds right up my alley. Paired with some delicious food and I’m in heaven. That view of the mountains looks absolutely stunning as well. Great Read! I am a huge wine fan and I would love to visit. I am actually currently in Sonoma about to have a glass and this popped up in my read list…how coool! Great views and info…thanks! I loved your descriptions of the wine and area. I would definitely love to explore Alto Adige, especially the paths along the promenades of Merano. It sounds just lovely! I think the mountain views would be enough to bring me to Alto Adige, but I’ve only recently become a fan of wine. I’m sure having a glass would be the perfect complement to the view! I’d probably get bored pretty quickly though, so I like the idea of a biking excursion. I haven’t heard of Alto Adige and didn’t realise that there was such a beautiful wine region on the border of Austria and Switzerland. 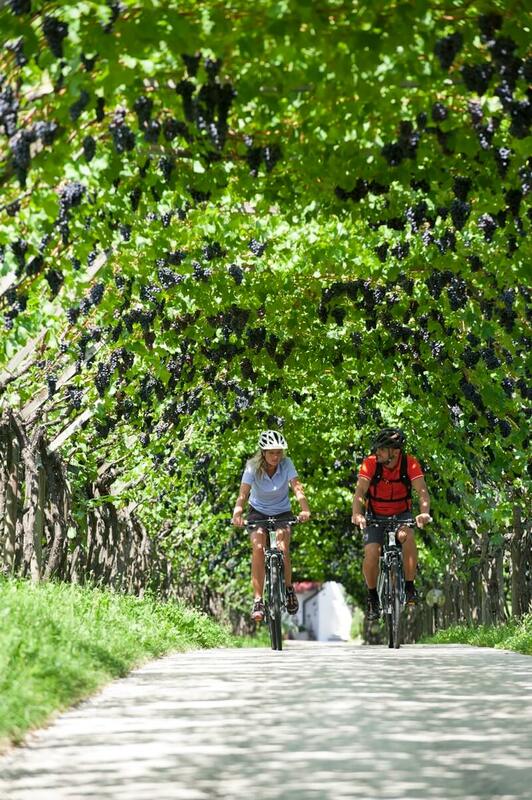 The sunny vineyards look like the perfect place to cycle around tasting fine Italian wine. What a lovely spot in Italy! Thanks for the comment Christina! 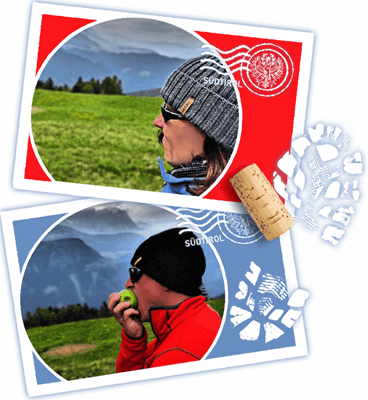 So glad we could introduce you to Alto Adige / South Tyrol. Hope you get an opportunity to visit! This post made my mouth water, Kate and Vin! It indeed seems like a must try wine. 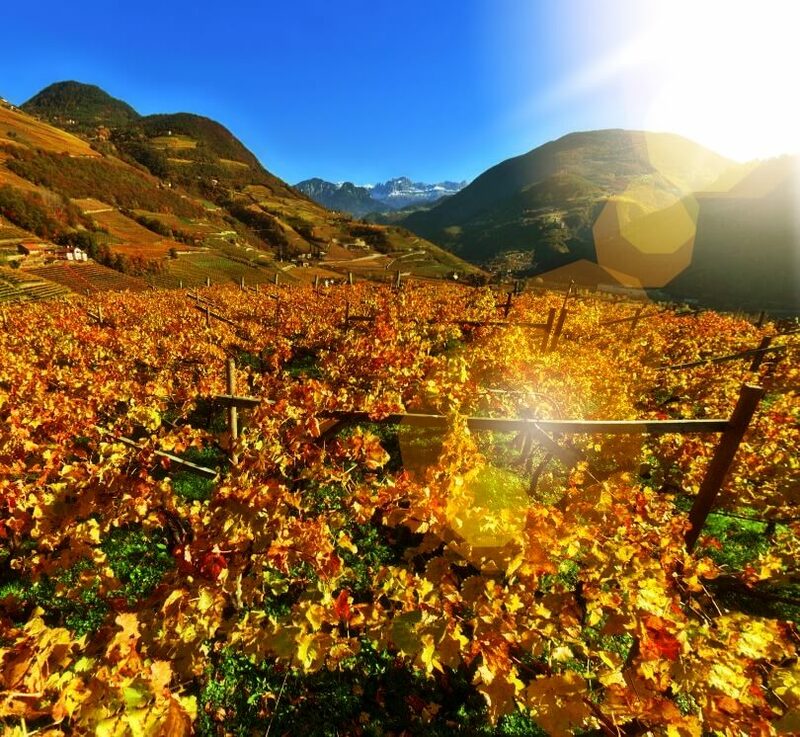 October seems like a great time to explore Alto Adige wine country. 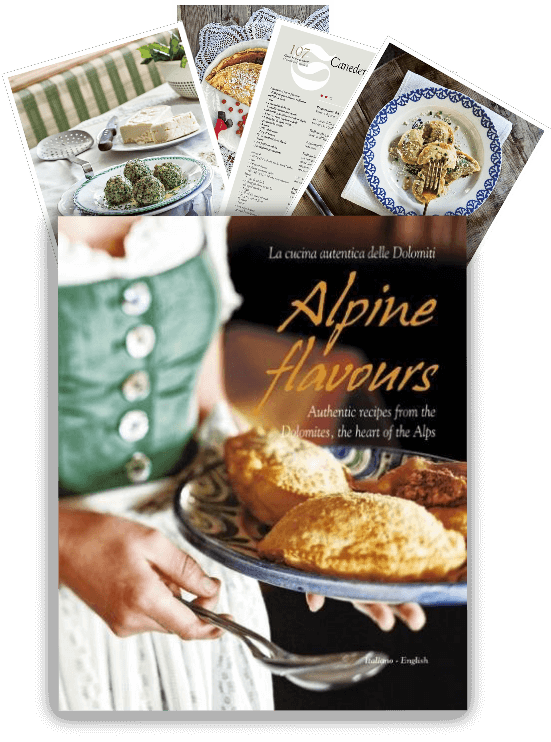 Glad we could provide some South Tyrolean temptation! Anytime is beautiful to visit South Tyrol, but autumn is truly special. Less crowds, lower prices and more vino! Wow, this is so gorgeous! I’d love to enjoy a glass of wine here with the view! I am not a wine drinker but I understand how awesome this experience is for those who love wine. Heck, I might even enjoy this one and start learning how to be a wine enthusiast. This is heaven from wine enthusiasts! To be honest, I only drink wine when there’s an occasion. 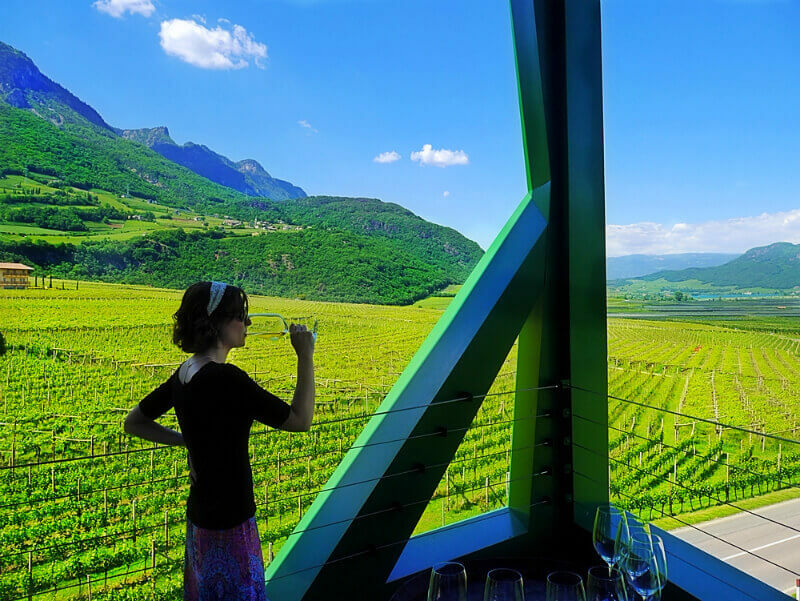 Your post makes me wanna travel just to taste the wines of Alto Adige! oh my gosh I would love to visit here! i’m a huge wine drinker and had similar experiences in Napa Valley in California & realllllly loved it! This scenery looks just amazing – especially with the Alps in the background! I would love to bike and try wines there. Haven’t tried the Gewürztraminer though, but now it’s definitely on my must-do list. 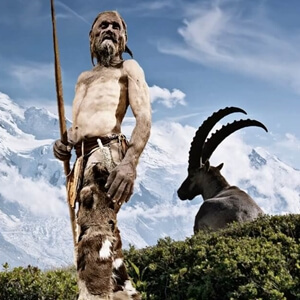 Hope you can visit South Tyrol! There are countless hiking and biking opportunities for all ages and skill levels. Enjoy the vino! Wow! This area is so beautiful! Gewürztraminer wine isn’t my favorite, but the beauty entices me to visit it someday. Had not heard the name Alto Adige, so thanks for explaining that it’s also known as the South Tyrol. It looks like a beautiful area to visit, and of course, tasting the wines is a must. I’m not hugely familiar with Gewürztraminer, have only tried a couple, so would be lovely to learn more during a tasting. Hi Kavita – Thanks for commenting! 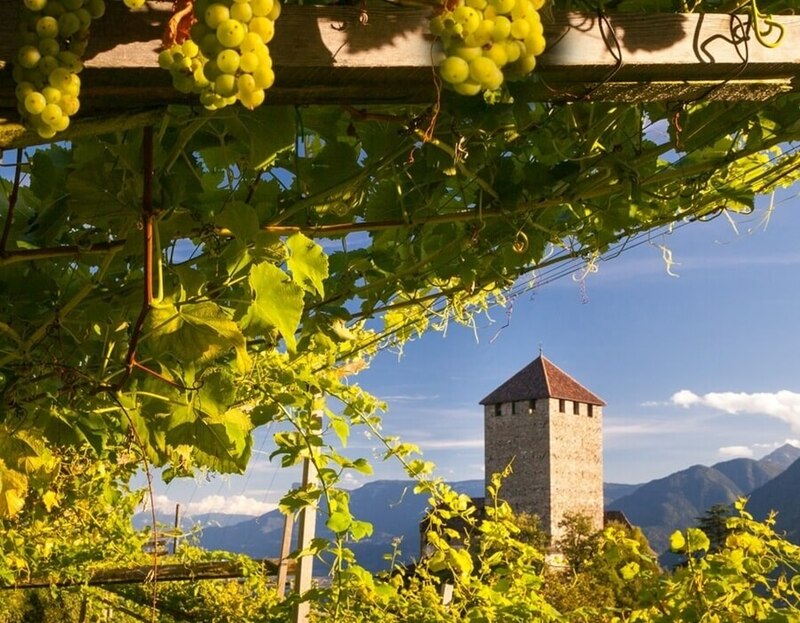 South Tyrol’s wine region is referred to by the province’s Italian name. Hope you take the opportunity to explore Gewürztraminer. It’s an exquisite white that more people should know. We have done a similar experience one time in our land and reading your post we are full of memories!